Google Clock has partnered with Spotify to make that morning alarm easier to handle. Rather than make do with the app’s preset list of alarm sounds, you can now link the Google Clock app to your Spotify account for a whole new level of musical customization. 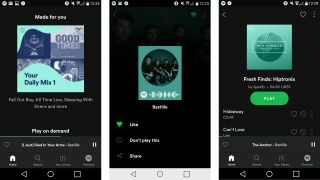 Android phone users still have the option of using their own custom tracks or downloaded mp3s as an alarm instead, though the addition of Spotify will allow you to access your favorite songs, choose from any of Spotify’s curated playlists, or just browse tracks you’ve recently played. Whether some light, crooning acoustic or thumping techno is the thing to get you out of bed, the new choice available means you’ll be able to personalize however you want. The feature is available for both Free and Premium Spotify accounts. As Google offers its own music streaming service, Google Play Music, it is still curious to see the company opt to integrate with a competing platform. With providers like Spotify and Apple Music leading the streaming market, however, the move is clearly convenient for customers and bodes well for the increased integration of Android services in the future. Both Google Clock and Spotify apps are available to download from the App Store, with all devices running Android 5.0 Lollipop or above able to make use of the feature.